First of all. Happy publication day to Alyson Noel. ‘Everlasting’, the final book in the Immortals series is out today! I am very excited about meeting Alyson next week at the Macmillan Blogger’s Brunch and will be telling you all about it. Having written 7 stand alone novels before I began THE IMMORTALS series, I thought I had a pretty good idea of how I’d feel once it was over. I imagined a moment of complete jubilation, where I’d leap from my desk chair and engage in my own version of the Snoopy Dance—infused by the thrill of having completed a very long journey—when in truth, it was nothing like that. The moment was bittersweet. I’ve watched Ever grow from an insecure, grief-stricken young girl who always second guesses herself, into a mature young woman who’s more than capable of facing her biggest challenge yet—who’s willing to do what she knows in her heart and her soul to be right, even though she risks losing everything she cares about. It’s been an incredible journey for both of us—and I hope that you’ll enjoy EVERLASTING as much as I enjoyed writing it! Now that my work on The Immortals series is done, I’m often asked which of the six proved the most challenging to write, and the answer is: all of them—though each in their own unique way. When I started writing Evermore, I was so focused on telling that particular story that I didn’t see it as the start of a series. I was just doing what I always did—attempting to make sense of my own life experiences under the guise of fiction. Ever’s grief over losing her family was directly channeled from my own grief over losing my loved ones, and as I began to find my way out of the darkness, Ever did too. It wasn’t until I’d reached the end of the story that I realized it was really just the beginning, she had a much bigger journey ahead of her, there was so much more still to tell. In book two, Blue Moon, Ever faces a heart-wrenching decision between the past and the present, and to be honest, I wasn’t entirely sure which path she’d choose until I stood on the precipice right alongside her. It was also around that point that I realized the true scope of her journey—the sacrifices she’d be required to make—and exactly how the series would end. Shadowland, the third book, provides a major turning point for the series. Not only are the stakes raised to a whole new level, but events that seem simple on the surface—the arrival of Jude, the flip-side of immortality, the Shadowland itself—ultimately bear powerful repercussions that’ll reverberate in later books. With Dark Flame I made a conscious effort to take Ever’s journey in a much . . . well, darker direction. It’s her struggle with the dark side of herself that allows her to locate the light in the person she once considered her enemy. It’s a powerful moment for Ever—one that redefines everything she once thought she knew about herself. A lot happens in the penultimate book in the series, Night Star—relationships change, serious decisions are made, and everything is put into motion for the grand finale to come. While getting all those pieces lined up sometimes felt like a very tricky game of chess, at its heart, Night Star is a story of friendships—or, more accurately, the fragile nature of friendships. How they can shift and change into something wholly unrecognizable—and how their dissolution can be just as devastating as any romantic break-up. As for Everlasting . . . well in an effort to avoid spoilers, there’s not a lot I can say except that it was a very bittersweet moment when I typed “The End.” I’d lived with these characters for the last few years, and probably spent more time talking to them than I did my own husband. They became almost real to me—like imaginary playmates—and I have to admit that saying good-bye was no easy task. Even now, as I continue my work on the spin-off Riley Bloom series, as well as my upcoming YA series, Soul Seekers, I occasionally find myself thinking about Ever and Damen, and Miles and Haven, and Ava and the twins, and Roman and yes, even Drina—wondering where they are, what they’re doing, and if they’re happy with the ending I gave them. Mostly, I hope that they’re happy. Today, the Alyson Noel blog tour kicks off! Check back here tomorrow for an exclusive letter extract from the final book in the Immortals series: Everlasting. Alyson Noel also shares with me her thoughts on the final book and I post my review of the book. Pete the Cat- I love my White Shoes has been a runaway success in American and reached #8 in the New York times picture books bestseller list. 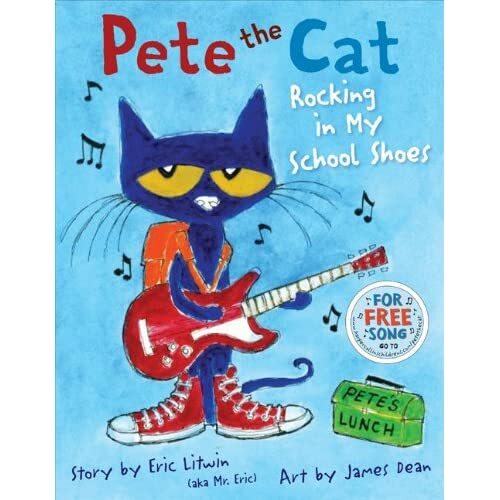 Now, along with the second book ‘Rocking in my School Shoes’, the books are being published in UK and Pete the Cat is keen to charm the British as much as he has the Americans. 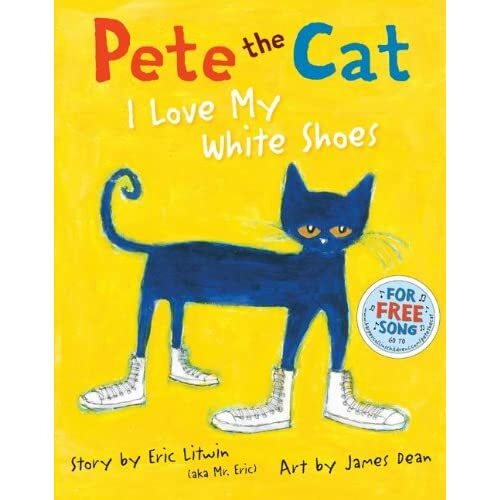 The first story in this fantastic series written by Eric Litwin and illustrated by James Dean follows Pete, a black cat with big white shoes. Along the way he steps in lots of different things including strawberries (he obviously doesn’t look where he’s going) and his shoes turn from white to red to brown to…wet! This doesn’t worry Pete because he is one of the coolest laid-back cats ever and just keeps on singing his song…because it’s all good. The second book titled Rocking in my School Shoes is all about Pete at school as he discovers all the different places a school has – the library, the playground and even the lunchroom. A fantastic, educational book which will certainly appeal to parents of children going off to school for the first time in September. Written like a song, the books are very lyrical and flow really well. Both books feature free songs which can be accessed online. The author has gone viral on YouTube and incidentally it is a YouTube video of two children reading and singing along to the book which got the books published in the first place. The illustrations, by James Dean are vibrant and very appealing to young children. Rather than follow the trend of digital illustrations, James Dean has followed the traditional route of hand drawing and painting with a very authentic and family appealing result. Whilst the style is undeniable American, that is part of this series’ charm and before long you will be humming along to Pete’s song because…it’s all good. Today, it’s my turn to host the lovely K.A.S. Quinn on her book blog tour promoting her new book ‘The Queen Must Die’ published by Atlantic Books this June. In this feature, the author blogs exclusively about her writing style, who inspired her characters and few interesting facts on the historical basis of the book. And, I have an exclusive extract from the book to share with you, from which the author shares her thoughts. If the extract doesn’t get you excited for the book, I don’t know what will! In which we meet James and Prince Leopold…. – a slight internal bleeding in the groin and upper thigh. Fill the bath with ice – the cold will contract the veins. froze, as did the boy, as they stared, stunned, at one another. ‘Now I’m done for,’ thought Katie, her heart turning over. ‘James – the cambric!’ the doctor called. found the bandages. ‘You stay there,’ he hissed at Katie. certain when it came to a gun. Alice’s upside-down head appeared again. to protest, until finally they calmed down and faded away. herself being pulled across the floor by one arm. about bolting, but the safety of the Royal Family came first. of the bed and bit the nail on her index finger, deep in thought. She shook herself as if to wake. Katie is having a frightening time of it. She’s ended up under a sofa at Buckingham Palace – not just in a different country, but in a different time. Queen Victoria’s daughter, Princess Alice, has befriended Katie and hides her under the bed. Now Katie’s been awakened in the middle of the night – there’s a major crisis afoot. I like the pace of this scene, and love all the medical stuff, but mostly I like that you meet James and Leopold. I have two boys of my own, so I wanted to write a book they would like. Wouldn’t it be awful if they read it and said “Girls! Yuk! On every page!” There had to be some believable boys. James is very like one of my own children: stubborn, brave, loyal and intelligent. He can be dour and grumpy; but if I were stuck in a lifeboat in the middle of the sea – I’d want James in it with me. Prince Leopold was a real person and did suffer from haemophilia. When I was researching this book, I spent some time at the Wellcome Trust medical charity reading contemporary accounts of Prince Leopold’s illness. I admire Prince Leopold, because he lived with a terrible, incurable disease, but still made the best he could of his life. Thankyou to K.A.S Quinn for taking the time to write about her work, and thankyou also to Atlantic Books. To accompany the book blog tour which is stopping at mine tomorrow, I have written a review for ‘The Queen Must Die’. Now since writing the post for the blog tour, I have felt a bit uneasy about writing The Queen Must Die. It doesn’t sound very patriotic does it? But all became clear after reading the book. Katie, an assuming teenager who loves nothing more than reading books under her bed. (Who doesn’t) Books are the one thing that keep her company. Her Mum isn’t around much, the housekeeper ignores her and she has none to zero friends at school. But Katie’s boring life changes pretty swiftly in the book when after falling asleep whilst reading, she wakes up in a very different place to where she began…Buckingham Palace to be exact. And it’s no longer present day – Katie soon finds out she has time travelled back to 1851, a time when Queen Victoria was at the throne and there were many threats to her and the Royal Family. Katie is forced to make friends and finds help in the form of Princess Alice and James who promise to find out how to get her home. 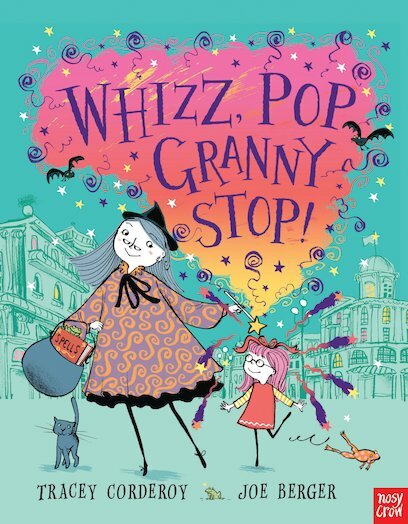 But that’s not the worst of Katie’s problems, she soon discovers a secret plot to kill the Queen and must do everything she can to stop it and whilst doing so…discovers she’s not the only person who can time travel. This comes at a time when Katie’s time travelling is explained in further detail. I usually get lost with time travel..Back to the Future was too complicated for me but the author deals with it very well and keeps it in-keeping with the story. The book reminds me of a similarly themed book I read a few years ago ‘Beswitched’ by Kate Saunders and it’s great that books which explore similar themes and subject lines can be so different and original. She ran the risk of historical fiction not working with sci-fi/fantasy themes but it does and the result is a fantastic action story suitable for girls and boys aged 9-12. The pace is fast, the characters likeable and I can’t wait for the next book The Queen at War in this trilogy; The Chronicles of the Tempus, due to be published in 2012. The author clearly did her research. 1851 was the year of the Great Exhibition and I was very interested to read about it in the book because I studied it, along with that era’s literature in great detail. Check back tomorrow for K.A.S Quinn’s guest post and an exclusive extract from The Queen Must Die.